We are self-confessed pygmy goat addicts! We warn all our customers, that it rarely stops with two .... that's how it began for us.... one pair of pygmy goats .... our current herd stands at over 70! Pygmy Goats are exactly that ...... small goats! They are playful, friendly, tactile creatures that enjoy interaction with humans and other pets/ livestock. 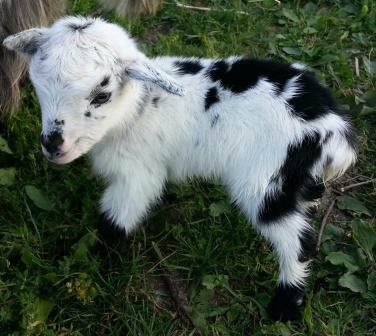 We usually have pygmy goat kids available throughout the year to good pet/breeding homes. Our goats are very much sought after due to the fact that they have no horns. They are either naturally polled (carry the hornless gene) or have been disbudded by our vet (so will not grow horns). By not having horns, this makes our pygmy goat kids ideal pets, especially if you have young children and other pets/livestock .The risk to the goat itself getting horns caught in fencing etc is now also reduced to nil. Photographs of our goats currently available can be seen in our Goat Gallery page. If you wish to reserve/view certain goats please contact us asap. Please note that our goats are only available in the minimum of a pair, this is due to the fact that goats are herd animals. Single goats will only be sold to someone with existing goats (proof required). Goats can only be reserved subject to receipt of deposit. Customers reserving goats via ourselves receive: Our New Owner Pygmy Goat Guide, Our New Owner Goat Health Guide, Disbudding Information (if applicable), Poisonous Plant Information, Discounts on Hay-Hutches and Our Essential Items List. Customers collecting goats via ourselves receive: Husbandry Handover Information, Animal Movement Documentation completed in line with ARAMS requirements, Basic Handover Health and Feet Trimming Training. For further information please see our "Contact Us" page.